Reinforce the events in the story and learn the days of the week using the Mrs Honey doll and hat pieces. The themed sorting and matching game can be played at many different levels, and a fabulous pop-up non-fiction book provides information about the spiders. Storysacks enable parents to contribute in a major way to their children's literacy and provide a valuable resource to teachers. A Storysack® is a large cloth bag containing a quality child's picture book with supporting materials to stimulate reading activities. To bring the book to life, soft toys of the main characters, artefacts relating to items in the story, a non-fiction element relating to the fiction theme and a game based on the book are included. A guide and prompt suggest ways of developing listening, reading and writing skills using the contents of the Storysack®. A well-loved story can be acted out in games of memory, observation and sequencing. Invaluable for early reading. 4 hat boards 49 story cards. 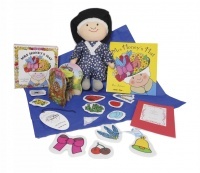 Encourage involvement in the story by using the hat pieces and doll (SOLD SEPARATELY) to act out the events.